Renowned Trawler Specialist, Jeff Merrill created his own independent yacht brokerage in January, 2014 after over thirty years in the marine industry and a lifetime of enjoying his passion for boating. Jeff Merrill Yacht Sales, Inc. provides the experience and personal attention you deserve by offering worldwide professional representation for buyers and sellers of premium brand, ocean-going trawlers. 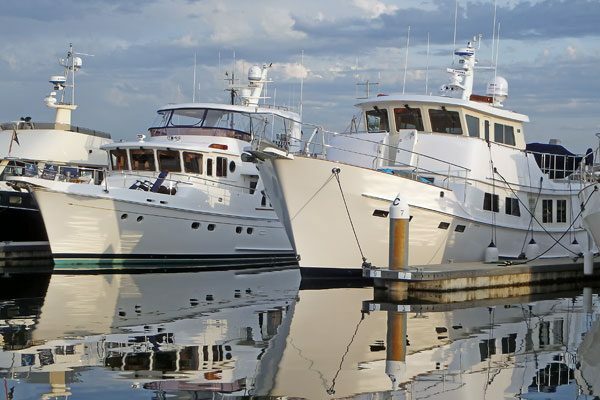 Jeff’s knowledge as a career yacht broker, writer and public speaker has enabled him to assist hundreds of aspiring recreational trawler owners to learn more about this booming segment of the boating market. As a future trawler buyer/owner there are several important choices you will need to make and there are some key things about how the yacht brokerage business works that you should be aware of. This website should provide you with a wealth of information to help guide you along the path to ownership and ultimately to the joys of the trawler lifestyle. If you are done cruising on your trawler and are looking for an in-touch and well connected firm to represent your trawler for sale, Jeff Merrill Yacht Sales, Inc. specializes in high end, ocean-going trawlers and can prepare a marketing plan to attract attention, solicit offers and help get you the result that matters – selling your trawler! The yacht brokerage business has changed over the years and even bigger changes are on the horizon. The internet has made the availability of information and the interconnection of people much more accessible than anyone in this traditionally tight lipped industry would have ever imagined. The traditional role of a yacht broker has been to collect and process the details of boats on the market or that may be coming on the market and to then connect willing buyers and sellers and “broker” the deal. With so many trawler owners out cruising the world and sharing their adventures through blogs and websites the need for a broker to connect the parties has become less necessary. Today’s trawler buyer trolls the web via click and search and has a huge information advantage available as they conduct their own research. By the time you are itching to pull the trigger and enter the hunt in earnest, you will not only be well informed (often knowing more about a particular trawler than the broker who is listing it) you will be more certain in understanding what you want to purchase and what the fair market value is. If you think of a trawler as a combination of a large land recreational vehicle (motor coach) and a waterfront home you aren’t too far off. The big attraction is to operate your own trawler along the coast, cruising in and out of harbors and taking off to explore isolated coves in the comfort of your floating home. Your trawlers’ on board systems and equipment features share much in common with the normal features of a house, but you also have a whole new world of boating equipment to understand and look after since you can disconnect from land – systems like steering, navigation, tenders, etc., which need to work trouble free away from shore in the undulating motion of the sea while underway. There is a strong desire for many of us to head out to sea to explore. This type of adventure is so much easier to pursue in a trawler than a sailboat (a trawler will typically cost more to own, but will be easier to operate than a sailboat). Ultimately there comes a time in your life where all of the factors line up to allow a window of opportunity to embrace the trawler lifestyle – if you plan and prepare you can put yourself into the position to truly live an incredible life aboard.